The Vesey Street escalator in Lower Manhattan is now up and running after being broken for nearly six months. 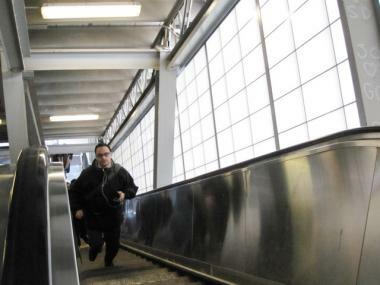 FINANCIAL DISTRICT — After being broken down for nearly six months, the Vesey Street bridge escalator is back in operation. The escalator, which allows pedestrians to ascend to the bridge over West Street, broke back in September. It needed a custom-made chain to be flown in from Germany before it could be fixed. After putting the escalator through some tests for safety precautions, workers removed security barriers and opened it up to pedestrians on Monday afternoon. The repairs reportedly cost $200,000. Still, confused visitors from the Bronx had to resort to the elevator after searching unsuccessfully for an escalator to bring them back down to the street. “How do elderly manage around here?” Virginia Shanahan asked of seniors’ previous ability to navigate the bridge with no escalator.